Click on each blogger’s MMGM label to read their post. 1. Leading the MMGM parade today is Karen Yingling at Ms. Yingling Reads. She reviews daily, is a past CYBILS chair, and librarian extraordinaire. In other words, she’s super human. Click on MMGM to read all of her reviews the past week. 2. Here at ALWAYS in the MIDDLE I have a review of DRAGON RIDER—The Griffin’s Feather by Cornelia Funke. 3. Author June McCrary Jacobs features a contemporary novel by Author Melissa Walker entitled, ‘Why Can’t I Be You‘. 4. Iron Guy Carl has two recommendations for those who can’t get enough of Han Solo. The Force will be with you by reading his post. 5. Michelle Mason at Musings of a Young Adult Writer reviews THE TRAIN OF LOST THINGS by Ammi-Joan Paquette. 6. Susan Uhlig is raving about the graphic novel and Newbery honor book ROLLER GIRL. 7. Patricia Tilton at Children’s Books Heal has a review of the magical MG novel, Bob by Wendy Mass and Rebecca Stead. 8. Andrea Mack at That’s Another Story is featuring The Miscalculations of Lightning Girl by Stacy McAnulty. 9 . Completely Full Bookshelf reviews a classic, Watership Down by Richard Adams. 10. Author Rosi Hollinbeck has a REVIEW and GIVEAWAY of The Miscalculations of Lightning Girl. Seems to be a favorite this week! 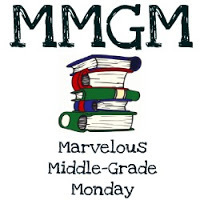 This entry was posted in MMGM Links and tagged Marvelous Middle Grade Monday. Bookmark the permalink. Thanks for the rotating shout out! Hope you’re getting ready for the new school year!